This item, one of many super finds made at the Pasedena Book Fair last month, is remarkable not only for the condition in which we find it, but also as a document of distance learning in the early 20th century - not entirely dissimilar to the Open University which we know today! A.L. Dyke was a remarkable entrepreneur who founded the United States's first automobile supply business in St. Louis, Missouri in 1899. As well as selling kit cars and automobile accessories, he establised a correspondence course in motor engineering, design and maintenance. Students would subscribe to the course and receive this pack containing four work books, each with questions that had to be answered and returned by post for marking, together with the working models which had been created by G.E. Sherrin in Britain in 1908, Dykes subsequently buying the copyright for the US. On completion of the four work books the student would receive a diploma. There is no diploma with this set, and the fresh condition of the models indicates that student no. 19423 never even began the course. Designed to be used, items such as this rarely survive - so thanks to this particular student for slacking off! The course is not restricted to automobile engines. There are sections on marine engines, submarines, aircraft and steamers, while volume 4 concentrates on early motorcycles including the Indian and the Harley Davidson. 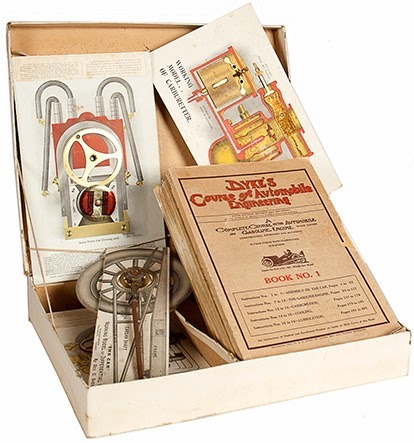 Original cream publisher's box 31.5 x 27 x 4.5 cm with red printed label to lid, containing four octavo paper-bound manuals and 5 working mechanical models, constructed of brass, tin and steel gears, springs and levers mounted on stiff card, depicting the transmission, differential gears, a four-cycle engine, a carburettor and a magneto; pp. 200 + , 201-424 + , 425-632 + 32 + 20, 221 + , numerous text illustrations; box with repair to hinge, models with signs of use but in full working order, wrapper of Vol I chipped with small loss to front, otherwise very good. 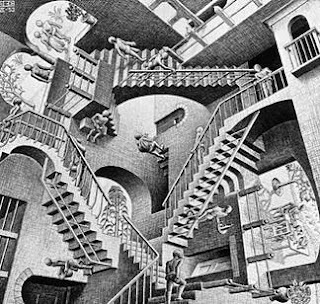 Fifth edition, revised and enlarged. Very rare.